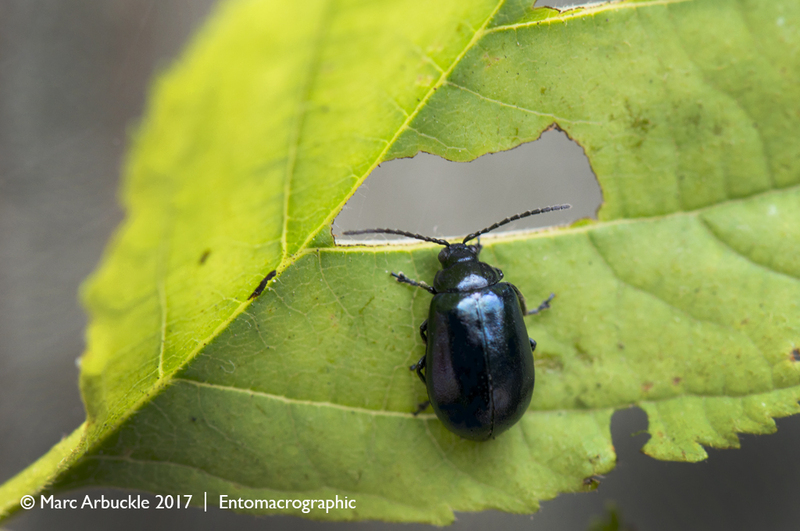 Until 2004, the blue alder leaf beetle Agelastica alni was thought to be very rare in Britain, possibly extinct although there were some historical records from southern England. Then in 2004 it suddenly appeared again in northern England in the Manchester area, Lancashire and Cheshire in 2006 and Yorkshire in 2014. It was found in Wales in 2013 and in southern England in Hampshire in 2014, mainly around Southampton*. I found it myself for the first time in Hampshire in 2015 near Eastleigh. I searched for it in Wiltshire in 2016 but couldn’t find it (not that I looked that hard) but of course it was only a matter of time before it arrived. So it came as no surprise when I received an email from David Lawman containing a couple of specimens he photographed in Bentley Wood in south Wiltshire on 11th June. Coincidentally the same day I received an email from Anthony Coles containing a photo of a couple of carded vouchers he found on 2nd and 3rd June in Foxham near Chippenham, north Wiltshire. Although in both instances the photos looked pretty convincing, they were a little blurry (and as I’ve only recently taken on the role of county recorder and I’m not an expert on chrysomelids) I passed them onto David Hubble for a second opinion. Dave runs the Bruchidae & Chrysomelidae Recording Scheme and is the author of the Keys to the adults of seed and leaf beetles of Britain and Ireland and the about to be published Leaf Beetles. Dave confirmed by return, as we all suspected, that they were indeed Agelastica alni.